All top Vatican sites in one morning. Fast track entrance with priority passes. No line access to St Peter's Basilica. Giotto, Raphael and Caravaggio in Pinacoteca, top Ancient Greek statues with Apollo and Laokoon, breathtaking Gallery of Maps, Raphael Rooms with world famous School of Athens, the Sistine Chapel with Michelangello'ss Ceiling and the Last Judgement. St. Peter's Basilica, the biggest church in the world. The tombs of Popes with tomb of St Peter, the Apostle. 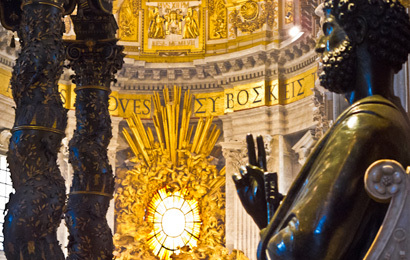 Bernini's Baroque splendor of St. Peter's Square.